The Help Center is designed to provide end-users with a complete self-service support option. They can get information from the knowledge base or turn to the community for answers. If they can't find an answer, they can submit a request to an agent. Note: The user interface described in this article is based on the default Copenhagen theme. If your theme is customized, options might appear differently or might be missing. For information about submitting and tracking support requests, see Submitting and tracking support requests in Help Center. Note: The Help Center might not offer both knowledge base and community. It depends on how the Help Center is set up. 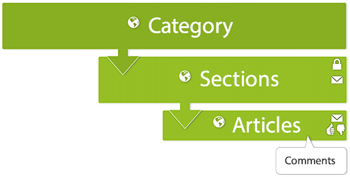 To get around the knowledge base, you can use search or browse categories and sections. If available, use breadcrumbs to go home or to a parent section or category. Depending on how your Help Center is configured, you may also have links to browse recently viewed articles, related articles, or promoted articles. You can subscribe to sections or articles so that you're notified when somebody creates an article or comments on an article. The community is where you can post questions or ideas or provide answers. Community posts are associated with topics of discussion. You can use search to get around the community or browse the community discussion topics. There are also sorting options available (see Sorting content in Community). You can subscribe to topics or posts so that you're notified when somebody creates a post or comments on a post. 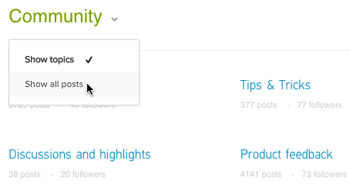 You can view content in community by browsing topics or by showing all the posts in community, regardless of topic. 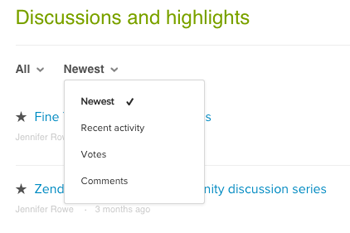 Within topics you can sort posts by newest, recent activity, votes, or comments. Within a post, you can sort comments according to date or votes. On the community landing page, click the arrow beside Community, then select Show all posts. All of the community posts appear in a list, regardless of which topic they are associated with. To show all topics again, select Show topics. In a community post, select Dates or Votes to sort the comments by the date the comments were made or by the number of votes the comments have. Comments appear chronologically by default, with the oldest comment appearing first. If the Help Center includes community, you can participate in the community by making a post or a comment to ask questions, provide answers, or share ideas, among other things. Before you post, it's always a good idea to run a quick search to see if the question has already been asked and answered in the community. You can view all your own contributions in one place. Click New post in the top-right side of any community page. Enter a Title for your post. Enter Details, which might be anything, including a question, feature request, or tip. Use the formatting toolbar as needed. The maximum file size for images in posts and comments is 2MB. Select a Topic for the post from the drop-down menu, if you want to change the selected topic. Click any link to go to your contribution. You can follow sections and articles in the knowledge base and you can follow topics and posts in the community. When you follow content, you are subscribing it, so that you will be notified by email when new articles, posts, or comments are added. You can stop following content at any time. And you can view all the content you're following in one place and manage your subscriptions there. In the knowledge base, you can follow section and individual articles. You cannot follow entire categories. In the community, you can follow topics and posts. You will not be notified when updates are made to existing articles or posts. You cannot automatically follow all new articles across Help Center. You must follow each section instead. Click the Follow, then choose notifications for only new articles/posts or for all new articles/posts and all comments. For articles/posts, you will receive email notifications for new articles/posts only in the section or topic. For articles/post and comments, you will receive email notifications for all new articles/posts in the section or post and any new comments. Navigate to the article or post. You can stop following content at any time if you no longer want to receive notifications. For sections and topics, you can also modify your subscription if you decide you only want notifications for new articles/posts and not all comments or vice versa. In the article or post, click Following. The button changes to Unfollow, indicating that you are no longer following the post; however, you will not receive notifications when the content in the article or post is updated. Depending on the plan type for the Help Center, you might have access to My activities. If so, you can view and modify all your subscriptions in one place. You must be signed in as an end-user to manage your subscriptions. Make any changes to your subscriptions. You can easily share a link to a comment on an article or a post to point users to the exact answer or solution. Click the options menu beside the comment, then select Permalink. Paste the link where you want to share it. You can edit your Help Center profile from any Help Center page to change your description. Click your profile icon on the upper-right side of any Help Center page, and then click My profile to display your profile. You cannot edit your name, avatar, phone number, or email address here. That information is set in your user profile, which you can edit by clicking your user profile icon in the top-right corner, then clicking View profile page. See Updating your user profile and password. I looked for the whole day, but i couldn't figure out how to allow the End-users to edit their complete profile. They can well change their name, image, telephone and e-mail (even their password), but nothing more. Shouldn't they be able to edit the "details" or the "notes" fields ? Beside, i created a Custom User field. Couldn't it be editable also by the end-users themselves ? The option "Allow users to view and edit their profile data" is well checked in the parameters. The built in functionality of the Help Center does not allow for any more fields outside of the 4 you mentioned to be edited by the end-user. This includes custom fields and the two fields you mentioned (details and notes). If you are looking to make this available to your end-user you may be able to develop something using our API. If you take a look at our Developer Portal, https://developer.zendesk.com/, you will find Zendesk's API, Apps, and SDK documentation. Off the top of my head, you could create a web form to display the fields you'd like to display and allow users to edit those fields. But like I said, this is not built in functionality and what you are seeing right now with regards to how the Help Center is functioning is all that is available "out-of-the-box." If you were to begin your Community with only one topic, is there a way to default the Community page to "Show All Posts" instead of "Show topics"? Can an 'End-User' export a report from their account of the tickets that have raised? I think this was possible in the old version. Hola, alguien sabe si puedo cambiar o bien ocultar la fecha de actualización de artículos? we don't have comments enabled in our help center as we don't want to create another channel for question and answers so following articles to get notified of comments made is not relevant for us. what is relevant however is for users following an article to be notified of changes made to it but it seems that they aren't. how can I give our end-users the option to be able to do that? I'm doing some Category/Section restructuring and cleanup of older articles. Is there a way to skip the notification to subscribed users when I make any changes? Hi Ingrid, I believe the notifications are only for when new articles are created in sections users follow or when comments are added. I don’t believe there are any notifications when articles are moved around or deleted. And not sure that there are notifications when sections are moved around or deleted either. But perhaps I’m wrong. Also I’m not sure if this is the right space to ask questions as mine hasn’t been answered since I posted it in May. Thanks for the tip, Catherine. I'm new to Zendesk (a little over a month). I'll reach out to support. Users are notified when somebody adds an article to a section, adds a comment to an article or a post, or adds a post to a topic. Only end-users can follow or unfollow. There's currently no way to view content that have subscriptions, so I +1'd the “Admin visibility of article/category follows” feature request. Asking again as Sherri did above, is this possible? How can I reactivate or reinstall the application? There seems to be some restriction to reinstall. Just wondering if we will ever be able to follow categories and receive notifications when articles are updated? +1 for email notification when articles in a section I'm following are changed. but received error : can't authenticate you. What credential am I supposed to use please? Thanks.